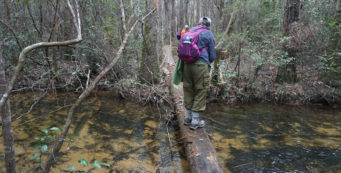 Wright Lake Trail | Florida Hikes! 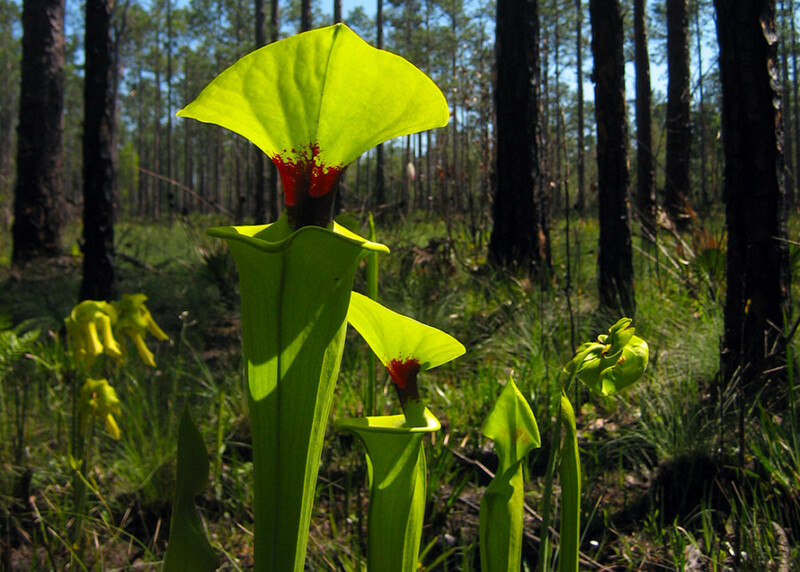 On the Wright Lake Trail, experience a diversity of habitats and some of the best pitcher plant viewing in Florida amidst the longleaf pine flatwoods upland from the Apalachicola River. 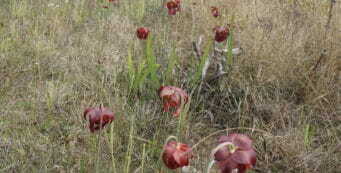 The nearly 5-mile loop crosses several creeks and works its way along a series of seepage slopes where pitcher plants bloom in profusion in early spring. A detailed map at the kiosk at the Wright Lake Recreation Area gives you a clue about what’s in store, including a walk along the edge of the floodplain forest of Owl Creek and a crossing of Coffee Branch. What it doesn’t mention is that you need to be a balance beam expert to feel comfortable on the long, narrow bridge with a cable for a handrail. What an adventure! 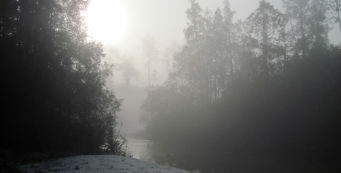 The Wright Lake Recreation Area is just southwest of Sumatra off SR 65. Turn west on Wright Lake Road and drive to the recreation area entrance on the right. 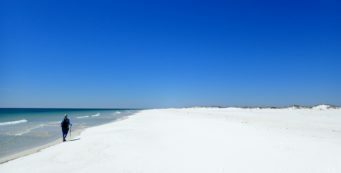 Pay a $3 per vehicle fee for parking and park within sight of the lake. Walk down to the lake and turn left to find the trailhead kiosk tucked away in the woods to start your hike. This blue-blazed trail begins at the kiosk and passes the end of the loop a moment later as it heads through pine plantations for Owl Creek before turning left within sight of the waterway to follow the floodplain. From there, you skirt the edges of pine plantations until you reach the “balance beam bridge” at 1.5 miles. The trail rises up into a stand of tall longleaf pines and then turns left to parallel a forest road. It’s along this section you’ll find the many pitcher plant bogs off to the left, the most spectacular of which is just before the trail crosses the road at 2 miles. 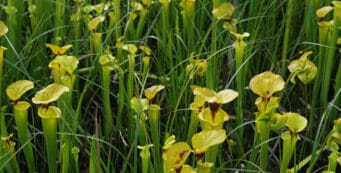 You’ll continue to see pitcher plants and hatrack cypress off to the left until the trail meets a jeep road at 2.5 miles and then turns left off of it to head through more longleaf pine forest. The trail crosses several major forest roads in succession (and goes under a power line at 3.6 miles) as you pass beneath longleaf pines marked with white stripes to designate red-cockaded woodpecker nesting trees. At 4.3 miles, you come to an intersection with a bench where white blazes lead to the left: that’s the Lake Loop Trail. Turn right and continue along the blue blazes through the upland forest and across a broad bridge before returning to the trail junction near the kiosk.